Shalita Grant and Francesca Choy-Kee in The Luck of the Irish. Photos: T. Charles Erickson. 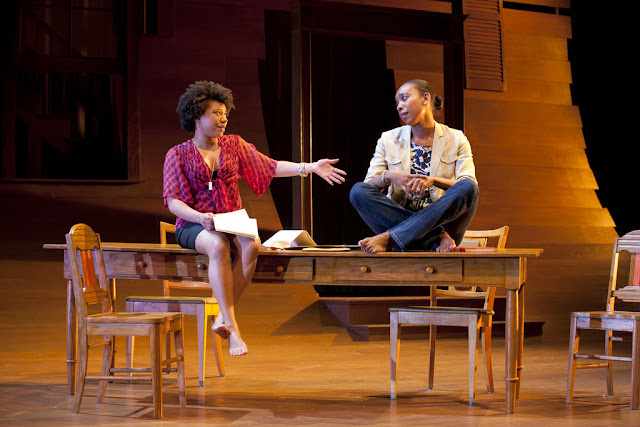 Over a year ago, I wished in a widely noted post that Boston theatres, rather than relying on Athol Fugard or some other proxy when attempting to engage with race, would instead produce plays that treated our own city's vexed racial history. Well, playwright Kirsten Greenidge was already working on a play along those very lines, and thus we now have the Huntington premiere of The Luck of the Irish (at the BCA through May 6). And I have to say - Kirsten and I had a great idea (although I think she thought of it first)! For The Luck of the Irish turns out to be not only a rich and satisfying drama on its own terms, but also, perhaps, a small inch forward in the limited racial dialogue we will allow ourselves on the sadly polarized millennial stage. Perhaps this is because The Luck of the Irish plays like an eloquent riposte to the cynical Clybourne Park, Bruce Norris's bitter, whiter-than-white prequel/sequel to A Raisin in the Sun, in which the races were portrayed as locked in an endless cycle of mutual contempt. 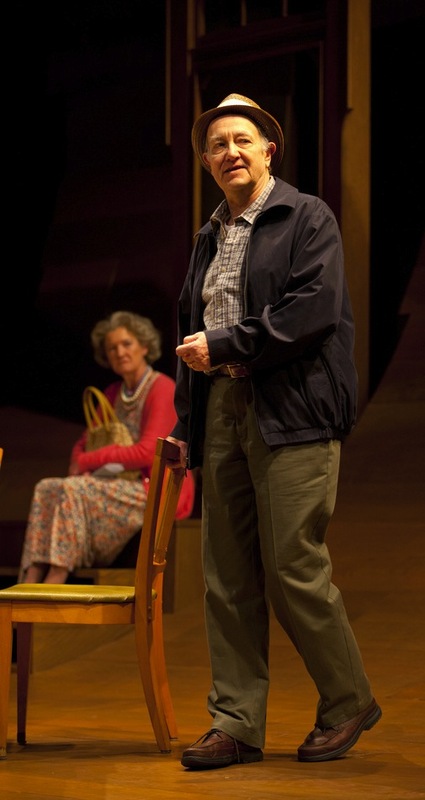 In contrast, Greenidge's script, though it too echoes Raisin and its concerns, is something quite different: a testament drawn from lived experience rather than from some playwriting echo chamber, The Luck of the Irish treats racism almost matter-of-factly - and perhaps more strikingly, it is calm and clear-eyed about the way class intersects with race. Indeed, by her dénouement, Greenidge has even offered something like an olive branch of sympathy across the color bar. Pay particular attention to that "lived experience" part, btw - a rarity, it seems, in millennial playwriting. Greenidge drew her inspiration from her own family's history: back in the 50's, her grandparents - here "the Taylors" - slipped into the all-white environs of Arlington (here "Bellington") by way of a "ghost buyer," who (for a fee) would purchase a property for an "undesirable" buyer before transferring the deed to the true purchaser's name in secret. In Greenidge's script, however, the actual transfer of that deed remains an open question till the final scene, as her fictive ghost buyers, the Donovans (particularly the missus) - return to haunt the Taylors' heirs (granddaughters Nessa and Hannah) nearly fifty years after the purchase of their home, claiming that the property in question "really" belongs to them. Now we've all known Mrs. Donovan. She's a classic Boston type - the hard-bitten, hatchet-faced Irish dowager, the (often literally) battered madonna of a tribe that almost cherishes the memory of its own oppression, while clinging to the bottom rung of the middle class (or the top rung of the lower class), obsessed with the defense of hard-won turf while blighted by a toxic mix of ignorance, corruption, and Catholicism. And needless to say, the Mrs. Donovans of the world were one of the last bastions of open racism in Boston. Not the cloaked, genteel racism of Arlington and Newton, but the bare-knuckled race-hate of Southie and Charlestown - that at the very least (they were proud to growl, if you dared to ask) was unapologetic and authentic. Yes, Mrs. Donovan has loomed behind Boston culture for so long that it's slightly strange she has never received any serious dramatic treatment. Then again, perhaps it's not so strange; the actual politics of Boston remain largely terra incognita on our city's stages. Even The Luck of the Irish offers us only a carefully controlled glimpse in the (rear-view) mirror, for this is a city locked in a peculiar mode of self-denial regarding its own culture and mores. Richard McElvain and Nancy E. Carroll. Indeed, I remember how that culture shocked me when I first arrived, now a little over thirty years ago; I never expected how baldly Boston's liberal veneer would be contradicted by its obvious policy of apartheid. I was coming from the South, so I was used to a system of open, but declining, racism - which my family had always opposed, btw. We were hardly heroes, much less martyrs, but we nevertheless received a fair amount of intimidation for our various stands on civil rights - slashed tires, rocks thrown at our house, anonymous small threats and aggressions meant to rattle you and get you to back down, that kind of thing. I knew plenty of people who went through more; in fact my brother-in-law's father once spent a night, Atticus-Finch-like, on the porch of a threatened black family with a loaded shotgun in his lap - just in case there were any unfriendly visitors. Yet oddly, when integration came to Houston, my home town, it came with less strife than anyone expected - partly because the races had always actually mixed, I suppose. And I went to an inner-city high school and had plenty of friends "of color," as we say now, and at eighteen naively imagined that a process had begun that would eventually lead to some more equitable social order. Boston, of course, put an end to those illusions. The city was obviously a war zone under an uneasy cease fire, with various avenues operating as virtual Maginot Lines, and liberal hypocrisy hovering over the landscape like so much acrid smoke. The city wasn't really a city, anyhow; it was a pile of of ghettos masquerading as a metropolis, with Roxbury at the bottom of the heap, far beneath the city's Anglican and academic overlords, who were elegantly detached from the scruff and scuffle of the street. The Irish in particular were huddled in neighborhoods they regarded as Masada-like redoubts, where they nursed memories of their persecution as well as resentments of the Episcopal ruling class, which after the World War had begun to disavow its long-standing gentleman's agreements regarding African-Americans and Jews - thus denying the working class their few irrefutable claims to respect: Christianity, and whiteness. It would be a lot to expect a single play to encompass all this blight and hypocrisy, I know. But The Luck of the Irish is at least a start - indeed, it's so quietly good that you keep hoping Kirsten Greenidge can squeeze more of the story in than would be humanly possible. She does, I think, get a certain kind of Mrs. Donovan just right - the kind that was not actually virulently racist, but was nevertheless trapped in a racist, underachieving milieu, and knew that she was falling ever further behind even as better-educated black folks got ahead under the new dispensation. And who, needless to say, forever clung to the vengeful dream of clawing her own back, one way or another. Greenidge knows this type through and through, and gazes at her with an understanding that verges on sympathy. And she captures her best character in a dozen small but telling details, as when Mrs. Donovan jealously imagines that the black Mrs. Taylor has a set of genuine Waterford crystal, an emblem of Irish status (it's actually fake). Other aspects of Irish are if anything even more intriguing, though perhaps less fully realized. We do wonder, for instance - why has Mrs. Taylor invested in that set of fake Waterford? And what does it mean for an African-American family to tear itself up from its own neighborhood and transplant itself to the hostile turf of a different race (particularly given that "black flight" is seen by some as a persistent socio-economic problem?). Playwright Greenidge is clearly aware of these quandaries, but only seems able to circle them, eloquently, without ever quite bringing them to a dramatic climax. Her second generation of "Bellington" Taylors are haunted by a sense of dislocation, and a persistent anxiety that despite the passage of time, they're still being "profiled" by their neighbors. Granddaughter Hannah in particular is worried that her rambunctious son is not only being stereotyped but also being goaded into a stereotype - he's both perceived as violent by his teachers, and yet is also egged on by his white chums to be the athlete, or the comedian - stereotypical "black" roles - rather than just the good student. She longs for him to forge his own identity - but what is that identity? We sometimes feel the Taylors are relying on their house to provide that which they themselves are unsure of. Reaching across the color bar - Nikkole Salter and McCaleb Burnett in The Luck of the Irish. Although perhaps Melia Bensussen's solid, but slightly uneven, production is somewhat at fault here. I consistently felt that Greenidge was willing to explore more complex psychological territory than Bensussen was. The playwright's portrait of her grandmother, for instance, includes a persistent shop-lifting habit (which ends up providing her grand-daughters a kind of ironic legacy). This idea - that Ms. Taylor perhaps knew somewhere that she had "gotten away" with something, that she even half-understood Mrs. Donovan's point of view - is quite intriguing, but right now there's little of this complexity in the lovely Nikkole Salter's portrayal, who gives us much the same mix of brains, beauty, and poise she offered last season in Stick Fly, but without the subtly unstable sense of alienation that I think Greenidge is hinting at. You can feel something like the same diffidence in the reliable Marianna Bassham's turn as Mrs. Donovan; she seems nervous about nailing a character whose political significance is so intensely fraught. But elsewhere there is very strong work indeed from Francesca Choy-Kee, Curtis McClarin, McCaleb Burnett, Richard McElvain and especially Shalita Grant - and Greenidge's calmly insightful voice seems to somehow sustain her action despite a slow start and a few static dramatic eddies (or conceptual gambits, such as people of different eras inhabiting the playing space at the same time, that don't quite come off). 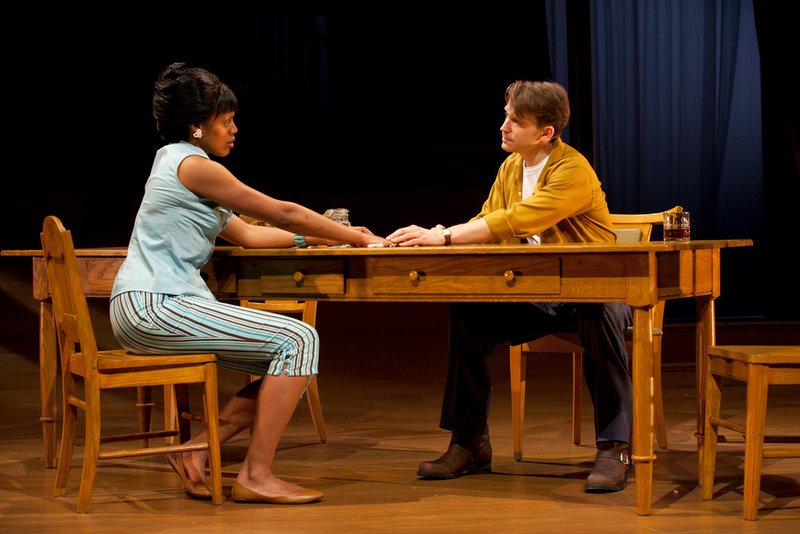 In my analysis of Clybourne Park, I wondered whether the "race play" wasn't played out - and I still feel that when it comes to polemic, the "race play" is played out. But Kirsten Greenidge proves that plays from life itself are never played out - and that perhaps in that context, our ongoing drama of race relations has only just begun to be written.